Schematic of the C9orf72 gene. The location of the intronic hexanucleotide (GGGGCC) repeat expansion (black triangles) is shown between the noncoding exons 1a and 1b, upstream of the start codon. (A) Expansion of the hexanucleotide repeat from the normal range (about 2–30) to very large sizes (typically about 100–1,000) is the most common genetic cause of ALS/FTD. Bars represent coding (yellow) and noncoding (red) regions, and the positions of the start codon (ATG) and stop codon (TAA) are indicated. 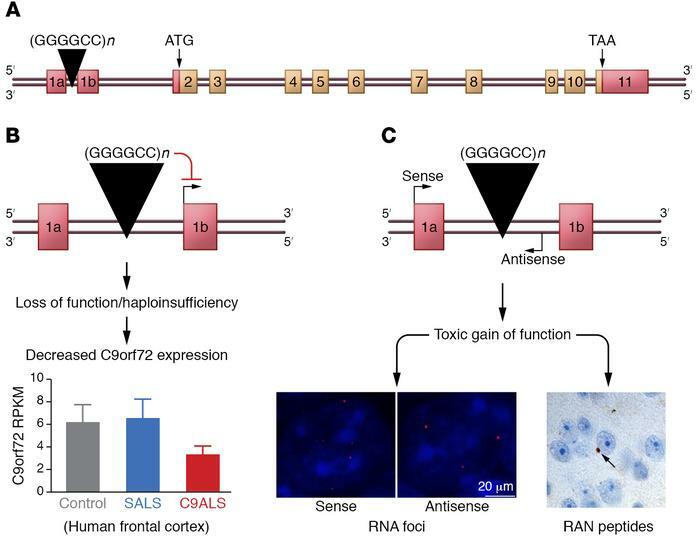 (B) Large GGGGCC expansions cause downregulation of C9orf72 gene expression, supporting that loss of normal C9orf72 function may contribute to disease. SALS, sporadic ALS; C9ALS, C9-associated ALS. RPKM, reads per kilobase per million. (C) Both sense and antisense transcripts containing C9orf72 expansions form RNA foci in cell nuclei, which may have a toxic effect on nuclear protein function. Repeat-containing transcripts can also serve as templates for RAN translation to generate simple dipeptide repeat proteins (RAN peptides) that accumulate in the brains of carriers and may contribute to disease through a variety of toxic mechanisms. C9orf72 expression data are based on data from Prudencio et al. (112). Sense and antisense foci and RAN dipeptide pictures are reproduced with permission from Neuron (147).